For the superhero in GTA IV, see The Brown Streak. A Brown Streak in GTA San Andreas, at Cranberry Station, San Fierro. The Brown Streak is a fully interactive passenger train featured in Grand Theft Auto: San Andreas. It is only available in gray (unless with use of the pink or black traffic cheat or with the use of trainers where custom vehicle colours can be set), and runs on the Brown Streak Railroad. In addition to the locomotive itself, the Brown Streak comes with two to four passenger coaches. The Brown Streak bears a striking physical resemblance to the EMD F40PH. The player can either ride in the train as a passenger (free of charge) by entering through one of the passenger entrances on the rear coaches. The player can also steal the train by entering the locomotive up front, assuming control of the train themselves. When riding as a passenger, the player may de-train at any stop (or during travel, if so desired). 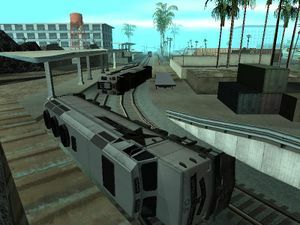 When driving the Brown Streak, the player has the option of engaging in cargo delivery missions (after unlocking the entire state), which require reaching each station in San Andreas within certain time limits. Small cash rewards are given for each successful stop, and a large reward is given at the end of the mission (after a complete loop of the state). A derailed Brown Streak near Verdant Bluffs, Los Santos. The train has some realistic effects, particularly the ability to derail it at high speeds. The train begins to shake above 47 m/s (~170 kph), at which speed it will derail upon turning (higher speeds are possible while travelling in reverse). If you're already in a turn, the buses start shaking at around 33 m/s. Trains are immune to all forms of damage, including weapon damage, fire and any physical obstruction, however derailment will render them useless. There are no first/third person views when driving or traveling in the train, and the cinematic view mode is the only view available when the train is travelling outside of the tunnel. Some 3rd-party trainers can offer different viewpoints. Although not making much appearance during the storyline, it has a prominent use in missions. During Big Smoke's mission Wrong Side of the Tracks, the player is required to use a Sanchez and drive beside the engine carriage so Big Smoke can shoot some Vagos who are riding on top of the train. During the mission, other trains use the track next to the train. A Brown Streak engine makes a cameo appearance in the mission Reuniting the Families, aiding the player by hitting some of the pursuing Police vehicles. During the mission Snail Trail for Frank Tenpenny, the player is required to follow a train with a reporter on board, who is going to meet somebody. Much like the earlier mission, other trains use the tracks next to the train. The train makes another cameo appearance during the final storyline mission, End of the Line. When pursuing the Fire Truck on the train tracks only the engine carriage will appear, unlike the other trains being locked, this one is can be stolen, stealing it will result in mission failure, as you will lose Sweet. This has a glitch where other trains still use the track the player uses, and when they hit the player's train, they will drive through it, as if it wasn't there. In Quarry Mission #6, the player is required to clear explosives off the tracks before a train reaches them. Once the player has cleared the line, or the timer has run out a Brown Streak train will rocket through, travelling much faster than any other train in the game. If the train's engine happens to end up in water, it will stay afloat indefinitely, with the sound of the engine audible above and below water. The player can climb atop the unsinkable engine as if it were a stationary platform, a testament to the train's indestructibility. Strangely, although the train cannot be damaged (or even moved) by other objects when on the tracks, it becomes as light as a feather once it derails, and can be pushed by the character easily. If one were run over by train at a station and the train parks on them to let passengers out, they can see that the passengers just sit in the middle of the train (it is possible to see "inside" it if one is stuck underneath it) as if they were the passengers of a car. When departing Cranberry Station towards Tierra Robada, The Transfender's door nearby opens as the train passes underneath. All of the Brown Streak Railroad trains, Freight and Brown Streak, have a slow acceleration and brake. Strangely, the train arrives and brakes fast at both Cranberry and Market Stations during the mission Snail Trail, although not stopping perfectly in Market Station. If you haven't unlocked all of San Andreas and walls are in the way of the train, it is possible to pass through them by driving the train very fast. The train will not brake on time before reaching the wall and thus you will pass through it (as the train cannot be stopped by any objects). You will receive a 4-star wanted level for trespassing into the locked area. This page was last modified on 14 November 2016, at 06:02.